President Doug Bennet and Midge Bennet accept a proclamation honoring Wesleyan’s 175th anniversary from City of Middletown Majority Leader Tom Serra. The City of Middletown honored Wesleyan University with a proclamation honoring its 175th anniversary. 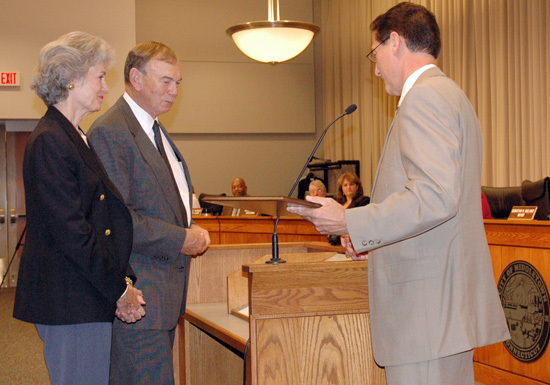 The designation was made during the City of Middletowns Common Council meeting Oct. 2. President Doug Bennet and Midge Bennet accepted the proclamation in front of the council members and the public. The proclamation is mounted on a wall plaque. Following the ceremony, President Bennet presented a brief history of Wesleyan, noting that it was founded in 1831 through collaboration among Middletown’s civic leaders. Some of these leaders were Methodists, some not, but all of them agreed that establishing a college in what was then a booming metropolis of 7,000 people would be a good thing for the town. So they banded together and purchased the land and buildings on High Street that had comprised Partridge’s Academy, which had closed for financial reasons.